Andrew Taylor takes the plunge with some of the world's biggest and most fascinating reptiles. James Bond narrowly avoided being breakfast for crocodiles by running across their backs to safety in Live And Let Die. But I doubt the same plan will work for me as Nigel Palmer, Crocosaurus Cove's head crocodile keeper, closes the escape hatch of the Cage of Death. "So you're going to write nice things about us, aren't you?" 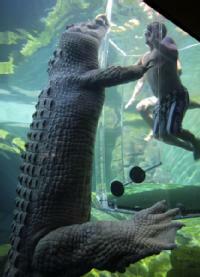 shouts Palmer as he lowers the cage into a water tank housing Chopper, a 5½-metre, 790-kilogram croc bearing the scars of too many fights and missing two front feet. Chuck Anderson is in Washington today to save the thing that bit off his arm. It happened in June 2000, when he was swimming in the Gulf of Mexico off Alabama. A seven-foot bull shark came up from underneath, knocking him out of the water. It snapped off four of Anderson's fingers, chomped at his belly, then ripped away his right arm below the elbow. The attack almost killed Anderson, 54. It also turned him into an advocate for one of the most fearsome fish in the sea. Something about surviving a shark attack and having time to think the matter over could have prompted the survivors to see another view on the matter of sharks. But that journey probably had its issues too (telling friends and family of interest in sharks, going public on the matter, becoming vocal supporters for sharks). Moko the dolphin had serious competition for the friendliest sea creature title yesterday as two orcas swam close to a Gisborne beach to hang out with a class of divers. Adventure Dive Gisborne students with instructor Jim Kahukoti were heading out for an afternoon dive navigation session when a huge orca and calf swam into a reef channel. The bigger whale, a male and at least seven metres long with a metre-and-a-half dorsal fin, swam so close that Mr Kahukoti was able to reach out and touch it. "It was the highlight of my diving career," he said after spending several minutes in the water with the big mammal. Friendly Orcas and a dolphin with a sense of humour. The world is a changing. It would have been amazing to see the Orcas interacting without attacking. If marine creatures could play videogames instead of taking away surfers' boards, would they experience attention deficit or ignore other creatures around them to play one more level? We need some university surfer students to figure out how to set up the experiment. Interactive university studying-surf while making dolphins and orcas play video games. The students would have to figure out a way to shockproof the video system underwater and make flipper controls. VANCOUVER - The baby beluga at the Vancouver Aquarium has been christened Nala — short for Nalautsaagaq, meaning surprise in Inuit. The winning moniker, suggested by the Joyce family of Burnaby, beat out 3,000 entries from across the country. Other top names included Sila, Kuvi, Nalli and Uumamarik. Katie Joyce said the family suggested the name “because Nala is a surprise gift for everyone who visits the Vancouver Aquarium to be able to see and learn about these amazing animals”. The Joyce family will receive a one-of-a-kind Beluga encounter hosted by the Aquarium’s marine mammal team, an annual family membership, and a $200.00 gift certificate from the gift shop. Beluga encounter? Swim with them or just get to touch one. Either way that would be a thrill. A report about a shark attacking a surfer in Florida-sadly, the surfer died as a result of his injuries. A male went to the surfer's rescue from a school of sharks and brought him back to the beach. A kite-surfer has been killed by what may have been a great white shark in a rare attack off the coast of Florida. Daniel Lund, a lifeguard who survived a shark attack 21 years ago, risked his life to try to save Stephen Schafer, 38, by swimming into the midst of a school of circling sharks. He pulled the stricken surfer on to a rescue board after spotting him flailing a quarter of a mile from Stuart Beach. STUART, Fla. - A shark bite victim pulled from the ocean off South Florida died from massive blood loss and was likely bitten by just one shark, authorities said Friday. Stephen Schafer, 38, was kiteboarding about a quarter-mile (400 meters) offshore in Stuart, 100 miles (160 kilometers) north of Miami, when he went into the water and was surrounded by at least three sharks, according to the lifeguard who pulled him from the ocean. Dr. Linda O'Neil, an associate medical examiner in Martin County, said Friday he died from blood loss. She said he suffered two shark bites, most likely from the same animal. It was not clear exactly what type of shark bit him. Grey whale picked good time to show--after games and BC place dome deflation. Anyone (marine specialist) sent to see if whale is ill, lonely or lost? Strange to hang out "downtown" without whale friends.